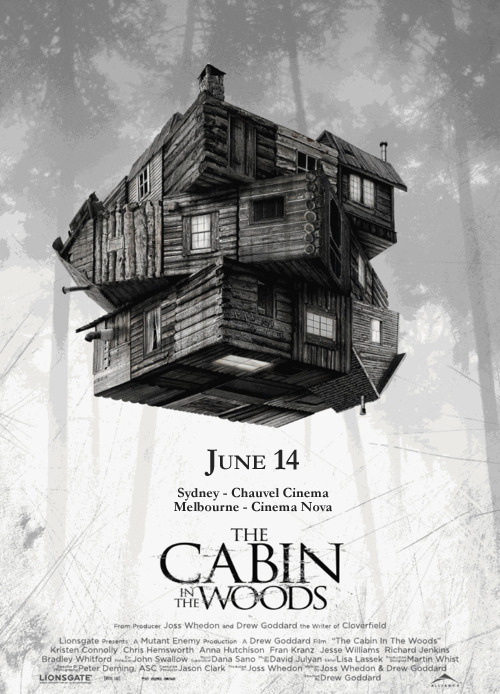 New Melbourne Browncoats, Inc. | We’ve got tickets to Cabin in the Woods! Can’t Stop The Serenity 2012 Get your crafty geek on at Continuum: Craftonomicon this weekend! We’ve got tickets to Cabin in the Woods! Join us at a screening of Joss Whedon’s latest film – Cabin in the Woods – on Friday 15 June at Cinema Nova! We’ve got tickets available for just $15 each. To get your tickets, you can find us at Continuum @ Rydges Carlton this weekend to buy a ticket in person (don’t forget that Friday entry is just a gold coin donation). Or email us at events@newmelbournebrowncoats.com with your name, contact number and the number of tickets you want (payment will be taken on the day). Cinema Nova will also be holding a midnight screening on Sunday 11 June (2 sessions starting at 12:01am Monday session). Tickets for these, and other sessions in the limited run can be purchased from Cinema Nova. 2 Responses to We’ve got tickets to Cabin in the Woods! What time is it on Friday? Session times will be released by Cinema Nova soon, but we’re told that it’ll be 30mins either side of 7pm at this stage.